Synopsis: Parapsychologist Dr. Elise Rainier faces her most fearsome and personal haunting yet – in her own family home. 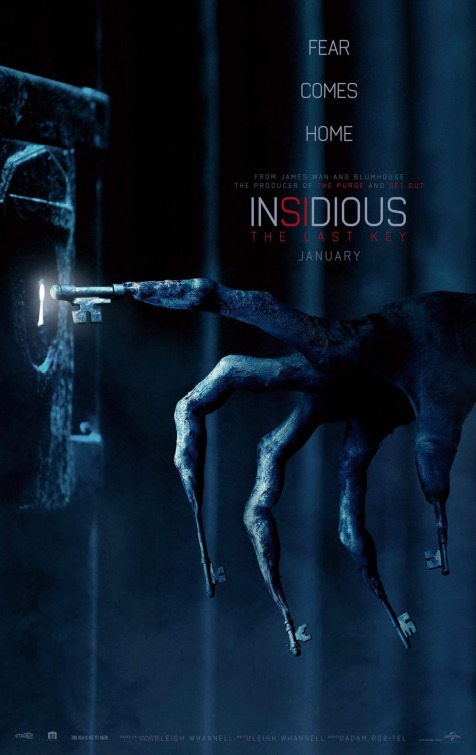 Thoughts: By the time Insidious: The Last Key is released in early 2018, audiences might be in the mood for a good scare. Even though Chapter 2 and Chapter 3 in the Insidious series were less than stellar, they still brought a certain style to the table that is sadly absent in similar genre films. What has me holding out hope for this fourth entry is director Adam Robitel joining a ghoulish gang that includes star Lin Shaye (A Nightmare on Elm Street) and writer Leigh Whannell (Cooties). Robitel was the writer/director of the fantastically chilling The Taking of Deborah Logan a few years back and if he can bring that flair for the scare to this one it might just be the first step in advancing these films past the constraints of their original lore. 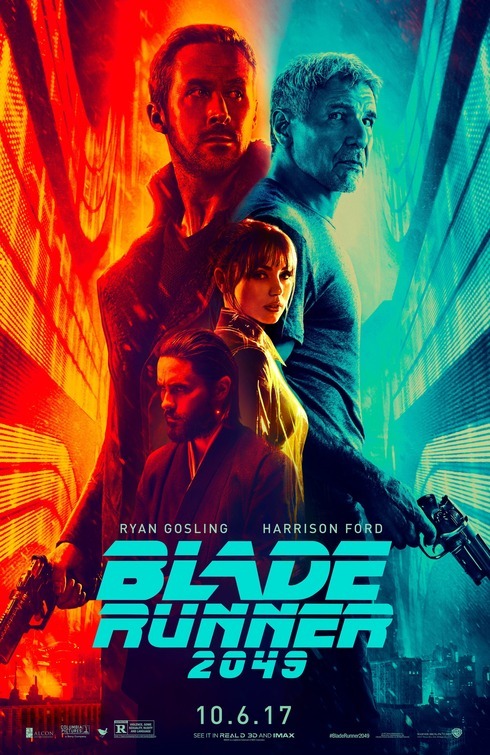 Synopsis: Thirty years after the events of the first film, a new blade runner unearths a long-buried secret that has the potential to plunge what’s left of society into chaos. The discovery leads him on a quest to find a former blade runner who has been missing for 30 years. Review: Though it’s enmeshed in pop culture now, it’s worth noting that when Blade Runner was originally released in 1982 it wasn’t anywhere near the hit it probably should have been. Way ahead of its time (as most Ridley Scott directed movies were in those days) and arguably overtooled for less than discerning audiences, the movie was a wonder of visuals but lacked a certain depth. Scott would later make some cuts and remove a tiresome voiceover narration from star Harrison Ford (Working Girl) and that started guiding Blade Runner to a new audience while reenergizing its original fan base. Honestly, the movie has had so many different versions released that I have trouble remembering which is which…but the Blade Runner you can view in 2017 is much different (and better) than the one first seen over thirty years ago. In this age of nostalgic and reworked reboots, when I first heard that Scott was coming back to the Blade Runner universe I was curious to see what the outcome would be. Having already dipped back into his canon with a prequel to Alien (Prometheus and, later, Alien: Covenant) would he be able to find that same new way in without totally destroying the memories of his original creation? Turns out, Scott did the wisest thing possible and stepped out of the director’s chair but kept his producer cap on for oversight. Handing over the reins to red-hot director Denis Villeneuve (Prisoners, Enemy, Arrival) was a stroke of genius because Villeneuve has delivered not only an exceedingly worthy sequel to Blade Runner but one of the most exciting visual spectacles of the year. At the end of the screening I attended for Blade Runner 2049, we were read a laundry list of items the studio and director would rather we not mention in our review. I’ve no problem keeping those secrets as to go into the film with any hint of spoilers would be doing a disservice to yourself. What I can tell you is that the film picks up 30 years after the events from Blade Runner when the original replicants from the first film have been all but obliterated, replaced with newer models that are programmed to obey at all costs. There are a few early replicants still roaming the overcrowded wasteland cities of the future, though, and a new blade runner (Ryan Gosling, The Big Short) is tasked with rounding them up and retiring them for good. During one mission, Gosling’s character makes a discovery that sets into motion a series of events that is equal parts mystery and sci-fi action suspense. His superior (Robin Wright, Wonder Woman) wants him to get to the bottom of things and eliminate any threat before anyone else does. That puts him in opposition with the new manufacturer (Jared Leto, Dallas Buyers Club) of state of the art replicants who dispatches his cold as ice henchwoman (Sylvia Hoeks) to get to Gosling’s target before he does. His journey eventually bridges the gap between the past and the future when he meets up with a familiar face harboring secrets of his own. That’s all! I can’t say more or the studio will send a blade runner to retire me! Villenueve has shown time and time again that he’s a master of both style and substance and Blade Runner 2049 is likely the pinnacle example of that. With jaw-dropping visuals incorporating seamless effects with Roger Deakins (Skyfall) gorgeous cinematography, the film is overwhelming in all the best possible ways. At 163 minutes, it could have had some major dips in momentum but miraculously the film keeps rocketing ahead, gathering speed and tension as it goes. There so many memorable sequences that it’s hard to pick just one that rises above the others, but be on the look-out for Gosling’s fight sequence set in a showroom amongst holograms of throwback Vegas entertainment. The finale showdown is also a white knuckle mini-masterpiece. While the A-list stars are pitch perfect, it’s the lesser-known supporting players that stuck with me long after the movie was over. Hoeks, in particular is a most exciting find. The Dutch beauty actually has more screen time than Leto and she’s scary good because you never know quite what her angle is. Carla Juri and Mackenzie Davis (The Martian) also contribute strong work as important contacts Gosling makes along the way. Answering some of the questions that Blade Runner left open may or may not happen here and this sequel may or may not close up shop with even more questions left for you to ponder…I won’t spoil some of the biggest surprises screenwriter Hampton Fancher and Michael Green (Logan) have waiting for you. See this movie on the biggest screen you possibly can find, preferably with the best sound system too. Villeneuve has provided a full-bodied entertainment package for you and it deserves to be seen and appreciated for the knockout it is.